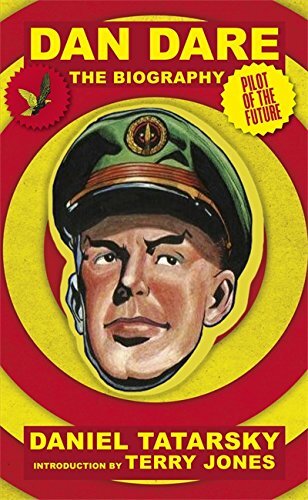 Dan Dare, saviour of planet Earth: the first biography. Dan Dare, pilot of the future, was the creation of Frank Hampson, a young artist who cut his teeth on Meccano Magazine. Beginning in April 1950, Dan Dare was the lead strip in the hugely successful Eagle magazine. The strip would only run to a couple of pages, but stories (and their weekly cliffhangers) could run for over a year. The majority of the strips involved Dan, a suave, natural leader, doing battle with all manner of alien lifeform to preserve the future wellbeing of Earth. Hampson's bold use of colour and figurative style (he used real-life models) were groundbreaking in post-war austerity Britain. In Dare Dare, the Biography, Daniel Tatarsky, with the entire Eagle archive open to him, researches the adventures of Dan Dare (and his co-pilots), and brings Britain's favourite space hero to life. Talking to the original writers and illustrators, Tatarsky tells the story of Dare and Eagle magazine, and paints a portrait of a nation emerging from world war II, ready for life on other planets.